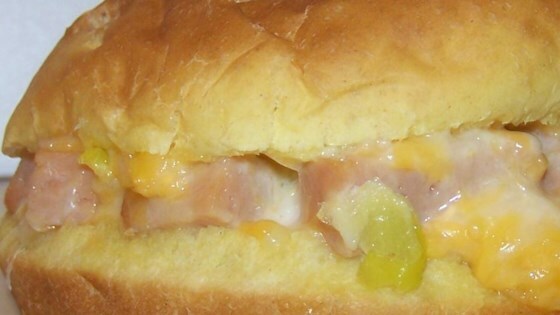 "These sandwiches are made with SPAM®, Velveeta®, relish, and mayonnaise. Very simple and easy, but very good." Stir together the luncheon meat, processed cheese, relish, and salad dressing in a bowl. Spoon the filling into the sandwich buns, and wrap each sandwich individually in aluminum foil. Place the sandwiches onto a baking sheet. Bake in the preheated oven until the filling is hot, and the buns have toasted, 10 to 15 minutes. Love these sandwiches! My family calls them Garbage Sandwiches. They are great the next day too! My sons loved these when they were little. I used english muffins and broiled them. made it tonight for dinner with baked beans and potatoe salad. it fills u up but it was to cheesy for me. Not bad! Tweaked the prep a bit - sliced the Spam thin and pan fried it to give it a nice crust, spooned it on soft onion rolls.